A sail-and-oar adventure in our own boat, one having the inevitable beauty of a form which accurately meets function - this is the dream of many of us. But Ben Crawshaw shows us that the dream is nearer to our grasp than we may think. In Gavin Atkin's Light Trow design he found a vision of beauty, a promise of seaworthiness, and an affordable boatbuilding project which would require the most simple and accessible of materials, and just basic woodworking ability. 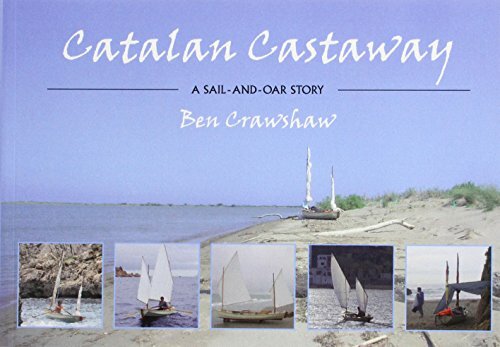 Within months he was afloat in 'Onawind Blue,' and "Catalan Castaway" recounts his day-sails, beach-camping cruises and a challenging longer voyage, over a five year period on the Catalan coast of Spain, where he lives with his partner and young family. 'Onawind Blue' has been Ben's passport to the traditional maritime community of the region, so in addition to her own exploits we learn of the indigenous boat types, many now endangered, and the dedicated band of people who keep them alive. Ben's increasingly ambitious adventures have sometimes made him draw on deep reserves of physical and mental strength, as has his personal battle with the 'giant octopus' of serious illness, happily now at bay.